"These tasty little things are always the first things to go at my dinner parties." Preheat oven to 350 degrees F (175 degrees C). Arrange phyllo cups on an ungreased baking sheet. In a large skillet over medium heat, melt butter and combine sausage meat and garlic. Cook until sausage is browned, about 5 to 8 minutes; drain grease, and add mushrooms. Stirring occasionally, cook 5 minutes more or until all liquid evaporates; remove from heat and let cool. 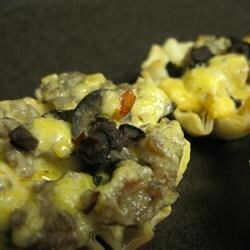 Fill each phyllo cup with 1 tablespoon of the sausage mixture, and top with a pinch of cheese. Bake in a preheated oven 10 to 12 minutes, or until the cheese melts and the pastry is golden brown. Serve immediately. These are so good if you just add some sauteed onion, bake the phyllo cups as suggested, and omit the butter! Like a reverse-stuffed mushroom and so much easier! These were great and a huge hit! I made pretty much as directly but added some Italian seasoning. I would suggest adding some half and half and italian cheese to the sausage mixture to make it more creamy.